No luck with getting 7-star Chewie. Running zeta'd Tier 12 Boba, zeta'd Dengar @ Tier 10, Tier 12 Cad Bane, Tier 11 IG-88 and Tier 11 Greedo. Modded for potency - no go. Changed back to 'original' modes. Can't even kill one character...No rhyme or reason. If those speeds are updated for what you have on them, they are way too slow to realistically have a chance. I created some mod sets, that were between +90 and +120 for each character. Your Cad Bane shows a speed of 113. Your team needs to be faster. Finally! I've been spamming this event since it began but missing Dengar I was really having trouble. 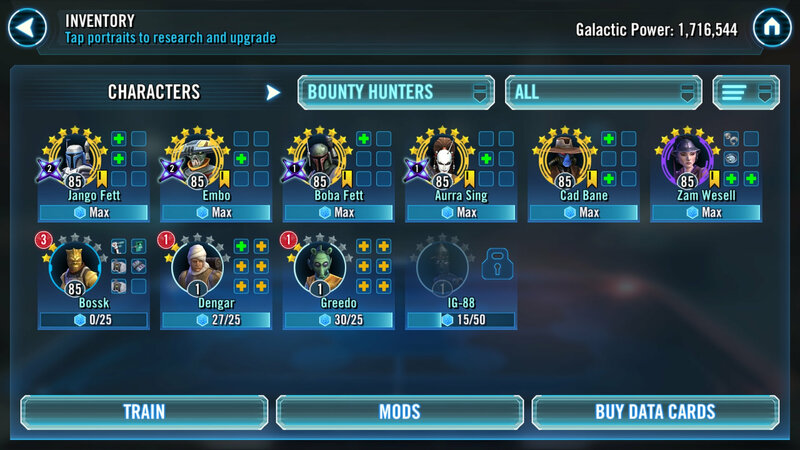 ZZBossk G12, IG88 G12, ZBoba G12, Greedo Gear 10. The winning round I focused on Han cutting right through the guard. Chewy went down next, I lost IG 88 and Greedo by this point. Lando then R2 and finally Leia. Very Happy I don't have to wait for another event. Keep trying!!!! Do you think it's possible with these guys to get 7* Chewy?? I'm thinking to use Embo as a leader.. Any suggestions?? I know some have done it with Boba lead, but Dengar is huge in that scenario. I haven't leveled up or used Embo, or Aurra, so I can't help much here. Looks like a good squad, but the Chewie event requires a lot of health (Bossk lead), or avoiding R2's smokescreen (via Dengar), or super high Potency with Boba Lead. That's all I know. Best of luck with it! Thanks for good information and wishes man.